The laws that govern squirrel as pets differ from state-to-state. Contact the National Wildlife Federation to ensure that you have proper pet documentation, and that your pet is legal. Cummins advises against using towels for bedding, because the squirrel might snag its claws in the ridges of thread. It is usually against the law to adopt wild squirrels as pets, but squirrel enthusiasts can legally purchase squirrels -- in some U.S. states -- from exotic pet stores. 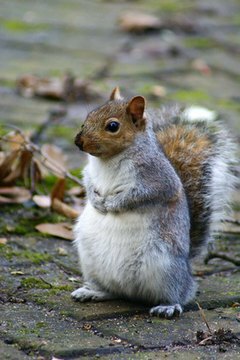 Eastern gray squirrels are the most common pet variety, because they are highly intelligent and plentiful throughout the eastern region of North America. They can learn to interact peaceably with humans through repeated exposure. Gray squirrels are easy to recognize by their curly gray fur and long, white tail-hairs. Because they are highly food-motivated, gray squirrels are good candidates for training. Provide your squirrel with a mesh-wire cage soft enough to prevent injury, says Jasmine Brough of "Animal World." Because squirrels feel anxious when closed in, make sure the cage provides at least 3 cubic-feet. Gray squirrels are easier to train when they have plenty of roaming space away from other animals and pets. Place plenty of soft material in your squirrel's cage. Mary Cummins of "Animal Advocates" recommends tearing a couple of old t-shirts into wide strips. Place these in the cage so the squirrel can fashion them into bedding. Add twigs, sticks and pieces of pine straw to the cage; this allows the squirrel to replicate a nest. A squirrel with appropriate bedding will have less anxiety about its captivity, and prove easier to train. Place larger sticks in the cage, so the squirrel can climb for exercise. Provide lots of chewing materials for your squirrel. Its teeth will grow rapidly, and it must have plenty of materials to keep them ground down and in check. Chewing materials will make your pet less likely to bite you. Cummins recommends stuffed animals marketed for small dogs. Remove the toy's eyes and other hard pieces that might be swallowed. Brough suggests placing tough pieces of tree bark and sizable bones in the cage. Place a small, ferret litterbox in a corner of your squirrel's cage, says Cummins. Squirrels adapt to litter training just like ferrets. This prevents messes while you handle and play with the squirrel. Pick up your squirrel gently, so that it does not become afraid of you. Brough advises against lifting the squirrel by its tail, as this can cause pain. Support the squirrel's entire body with your hands so that it feels secure. Pet your squirrel gently when you pick it up. Designate a name for your squirrel. Gray squirrels hear well, and can learn to recognize and respond to their names. Call your squirrel by its name each time you interact with it. Teach your squirrel to come when called. Provide nuts or berries when it responds to your call. Greet it affectionately when it succeeds. Positive motivation will help ingrain the behavior. Provide your squirrel with opportunities to play outside. Cummins notes that squirrels can be trained to walk and play on leashes. Keep your leash long, and encourage the squirrel to climb a tree. BBC News: How Are Squirrels Trained to Act?